How to Play Blu-ray Disc Movies on Windows Vista? Due to Blu-ray licensing, Windows Vista doesn’t include the ability to play Blu-ray discs and files natively. However, UFUWare Windows Vista Blu-ray Player provides you an easy solution and teaches you how to play Blu-ray Disc on Windows Vista. 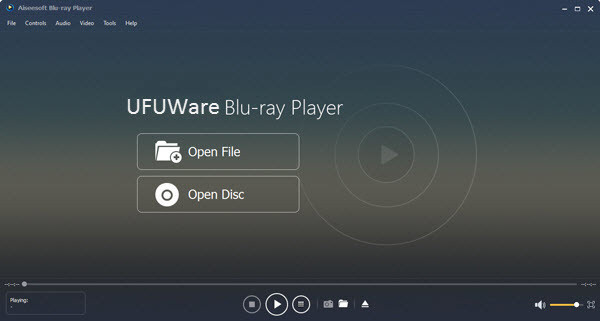 UFUWare Blu-ray Player Software, is an essential option for your home entertainment experience. This powerful and easy-to-use software has the ability to play any Blu-ray disc from any region, all Blu-ray folders and ISO image files on Windows 8.1/8, Windows 7, Vista, XP. It also canplay 1080p HD video and AVCHD video with excellent quality and smoothness. Guide: How to play Blu-ray Disc on Windows Vista? You can choose the favorite Blu-ray Disc and inset it to the Blu-ray drive, the internal or external Blu-ray drive are both available to use. Then you should download UFUWare Blu-ray Player for Windows Vista at here and install it on your computer, and then launch the Vista Blu ray Playing Software to pop up the main interface. Click “Open Disc” button and select the Blu-ray drive to load the Blu-ray Disc to the Blu-ray Player for Windows Vista. And the program would play the Blu-ray Disc automatically for you. Click the “Controls” column list at top left corner of the main interface, here you can choose your preferred title/chapter to watch, and choose previous or next title/chapter for playback. Besides, you can Pause, Stop, Play, and Volume up, Volume down your Blu-ray movie at bottom of the main interface. Furthermore, it allows you to capture the favorite image with the “Snapshot” function.